America’s public school system is broken and M. Shannon Hernandez knows why, firsthand. After fifteen years in the teaching profession, three gut-wrenching realizations forced her to recognize that she must leave the career she loved so dearly. She knew that if she continued to work for a failing system, she would also continue to lose a little piece of her heart and soul every day. You are invited into Hernandez’s classroom for the final forty days of her teaching career to understand the urgent need for school reform, clearly demonstrated in each story. You’ll witness the intelligence, vulnerability, and humanity of her students, and the challenges teachers like Hernandez face as they navigate the dangerous waters between advocating for and meeting students’ needs, and disconnected education policy. This book is not only a love letter to her students, her fellow teachers, and to the reformed public school system she envisions, but also a heartfelt message of hope, encouragement, and self-empowerment for those who feel they are stuck in soul-sucking careers. It is an essential read for each citizen who is seeking a life comprised of more purpose and happiness, as well as parents, teachers, administrators, and policymakers who know our nation’s education system is in desperate need of an overhaul. Enjoy the book trailer for Breaking the Silence below. 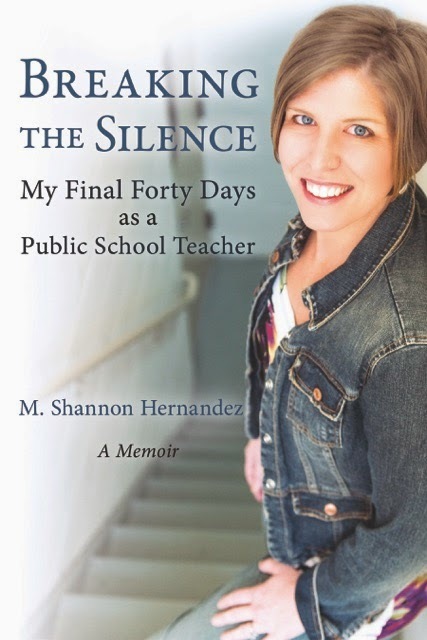 Breaking the Silence: My Final Forty Days as a Public School Teacher is available as an e-book and in print at Amazon, Barnes & Noble, and IndieBound. To win a copy of Breaking the Silence, please enter using the Rafflecopter form at the bottom of this post. The giveaway contest closes this Friday, March 13 at 12:00 AM EST. We will announce the winner the same day in the Rafflecopter widget. Good luck! M. Shannon Hernandez is the founder of The Writing Whisperer, and her mission is to help heart-centered entrepreneurs and heart-centered authors find their brand voices, share their unique stories, gain more visibility, establish themselves as experts, and create authentic marketing messages, all through the use of smart content strategy and engaging copywriting. 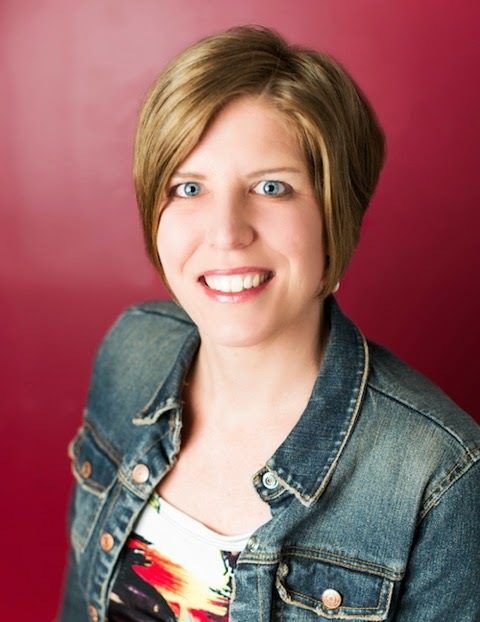 The Writing Whisperer was named one of Top 100 Websites for Writers by The Write Life in both 2014 and 2015, and Shannon has been featured as a content strategy and copywriting expert on many prominent podcasts and websites. She is a leading voice in the world of authentic business writing and heart-centered education reform, and she writes regularly for The Huffington Post. Shannon’s memoir, Breaking the Silence, chronicles her exit out of public education, after 15 years, and provides readers an intimate view of her journey to business ownership, finding happiness, and reinvention. WOW: You wrote Breaking the Silence: My Final Forty Days as a Public School Teacher based on journal entries you wrote during the final days of your fifteen-year career. How long have you been journaling and how did it help you put together the first draft of your memoir? Shannon: I have been journaling since I was about seven-years-old. Back then, I scribbled my most prized thoughts in my purple and pink sparkly journal, and then padlocked it closed so my siblings wouldn’t read it! I never intended to write a book based on the journal I kept for those final forty days. I really just set out to record all the funny, clever things my students said, as well as the frustrations I had with “the system.” I wanted the journal to remind me, if I ever thought about going back into the classroom, everything I loved about teaching, but also everything that had stolen my passion for it. The defining moment—when I knew I would use my journal to write a book—came when I was brought up on charges of misconduct in those final days, because I had shared a group hug with a group of students the year prior. It angered me, it hurt me, it cut deep into my heart and soul—and the journal then became a guide for my book. I took notes of everything that happened from that moment forward, and then, when it was time to weave the story together, I followed the outline. Some of the memories I wrote didn’t make it into my memoir, but about 85% of them did. WOW: Our readers are always interested in hearing about an author’s path to publication. Can you tell us a little about yours? What was the publishing process like? Shannon: Grueling. There is so much information to sift through when deciding to publish. I spent hours in research mode, because I knew I didn’t want to submit my manuscript to a publishing house—so the POD (Publishing on Demand) model is the one I went with, in the end. 1. I didn’t want to change one concept in my story. And oftentimes, many rewrites have to take place, and publishers get the say-so when it comes to the final manuscript. 2. I didn’t have time to waste. I knew what I wanted the title to be, and I knew that I couldn’t waste 2 or 3 years (or more) waiting to get published, with a time-sensitive story. 3. I loved the title I had crafted. And I didn’t want a publisher to change it. WOW: You launched your company The Writing Whisperer while planning your exit strategy from teaching in the public school system. How did you first get the idea for it and the types of services you would offer? All of these reasons shaped the first services I offered through The Writing Whisperer. I basically branded myself as a content coach. I taught people how to write better for their businesses, and I coached them along the way, when they were discouraged or lost in the process. WOW: One of the services you offer through The Writing Whisperer is coaching other memoir writers. What do you think makes you stand out as a writing coach? Shannon: Besides my passion for writing and my upbeat can-do-anything attitude, I’d have to say it’s the strategy piece for the memoir genre. A brand new client can come to me with an idea for her memoir, and within a 45-minute conversation, I have helped her to identify the overarching theme, the structure the book will follow, and we’ve started outlining the chapters. I’m blessed with a brain that can see the big picture, as well as work out the fine details so my authors start writing from day one. WOW: You worked as an educator for fifteen years, and now continue to advocate for education reform without the fear of repercussion you faced in the public school system. You describe yourself as “a teacher for life.” Can you tell us a little more about that? Shannon: This question made me tear up and cry. I am a teacher for life. I knew I wanted to be a teacher from a very young age, when I lined up my stuffed animals, Cabbage Patch dolls, and little sister, Kristi, and taught for hours. Teaching was always, and will always be, a part of who I am. I find happiness in teaching people all kinds of things. This past week, my neighbor needed help with her bread machine. I answered the text, did some troubleshooting, and we got her on the path to fresh baked bread in no time. My husband recently needed help with writing a few speech proposals for a conference. After drafting, he called me over to revise and edit. The good news? He was chosen for two slots at the conference. And recently, a reader of my book emailed me, and said she too wanted to reinvent her life, and asked me how she should go about getting started. All of these are teachable moments. All of them feed my soul and continue to show me that I can teach and inspire daily. WOW: What has been the overall response to Breaking the Silence? Have you heard from a lot of educators who’ve shared similar stories to the ones you describe in your book? Shannon: I purposely put my email address at the back of my book. I want to be a resource to people and help however I can. I, of course, believed in my story—but it took so much vulnerability to write about those final forty days and the loss of my childhood dream. I wasn’t sure how the book would be received by fellow educators across the country. Would they think I had quit and had no right to talk about education after leaving? Would they be inspired by my story? 1. To thank me for speaking the truth about what is happening behind closed school doors. 2. To tell me that my book has helped them to heal, in one or another, or has inspired them to fight more for student-centered reform, fight more for their own happiness, or to fight more for a personal or professional reinvention. 3. To tell me that they too, have been brought up on bogus charges by bullying administrators, and that my book is helping them to heal. They know they are not alone. They don’t have to live in shame anymore. The realize these incidents are not isolated and that they are not a “bad” teacher. WOW: Your work in education is far from done. Could you tell us a little bit about the podcast that launched last week, and how you got the idea to talk about education reform through the lens of love? Shannon: Wow! I am loving my podcast journey so far, and have recorded about 15 episodes to date. 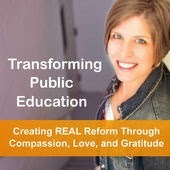 Here’s a brief synopsis of the show, Transforming Public Education: Creating REAL Reform Through Compassion, Love, and Gratitude: The Transforming Public Education Podcast is dedicated to helping teachers, administrators, and parents create a school environment where students of all ages can’t wait to get their days started! Through interviews, personal insights, and conversations, you’ll learn how to transform public education by creating REAL reform that begins with you. I’m a professor at Brooklyn College, as well as a consultant in NYC public schools. I see a lot of problems—and quite sadly, these problems could be solved, rather easily, if people thought outside of the box, sat down and talked with one another to address the issues, and put students FIRST in the entire education reform battle. I believe love—and the voices of teachers and students—are the missing ingredients in education reform. My podcast is all about highlighting what is working in schools, what could be improved at the very local, school-based level, and how to go about doing that. Think savvy advice, from those who are doing it well, and practical tips to implement the next school day. WOW: The Write Life website has named The Writing Whisperer one of The 100 Best Websites for Writers for the past two years. Can you give us some tips for writing and producing posts that attract the attention of so many visitors/readers? I think too that because I am so committed to producing weekly content—that of high quality and that which is helpful to my audience—my audience sees that I practice what I preach. What I mean by this is that I am always telling people to be REAL in their language, and then you get to a post like this one about how writing first drafts is like a trip to the gynecologist, and you can’t help but think, Damn, she really did just go there and write about this very real thing women experience at their annual exams. I also believe that consistency plays a huge part in my website’s success. When a blog is updated weekly, people want to see what is happening, and they come back to find out more. WOW: Do you currently have any other books in the pipeline? What are the topics that interest you most as far as what you might like to write about in the future? Shannon: Ha! I get this question all the time. Heres’ the truth: I have about a million more books I’d like to write. But, I am committed to marketing this one well, for at least three years, before I dive into another book. Writing a book is no joke—I put my life on hold for 2.5 months so I could finish my book. I have never been one for dragging out projects. And then, I realized, the editing was the REAL work—haha, and I had to then edit for another 4 months. And the fact of the matter is, while I do love writing, I also want to have a bigger impact on the world, and that means I need to get my book into more hands. And that means…marketing the book to the best of my ability. As far as topics for the future, there are many. I am a rural girl transplanted right into the heart of Brooklyn, New York. My hometown has less people than the highs schools here (Fairbury, IL, population 4000). I moved here for a new experience and because my husband lives here, and boy-oh-boy, do I have some culturally-shocking stories to tell. I think I could write an entire book about being a transplant, and what I have learned about myself over the years—the good, the bad, and the beautiful. I have always loved being transported to another place through travel writing. And, it looks like I’m headed to the perfect destination to really dip my fingers into the ink well and get started. In June, I’m traveling to Bali to do some work with a company there, to volunteer with baby elephants (Eeek! ), and to experience rice paddies and Indonesian culture. I’ve toyed with putting personal pieces like this on The Writing Whisperer blog, and maybe, just maybe, this will seal the deal. I think my readers would like to get to know me a little better, through my experiences and travels. M. Shannon Hernandez talks about "Reinventing Your Life, One Journal Entry at a Time" in this inspirational guest post. Change is possible. Shannon Hernandez shares the story of how she went from a school teacher to a business owner in four months flat. Find out why you should read Breaking the Silence in this review by Renee Roberson. Readers are reaching out. Shannon discusses some of the feedback she's received since the publication of Breaking the Silence. Thursday, March 19 @ Margo L. Dill, Children's and YA Author: Be Unique. Be Strong. Be Yourself. Do you want the courage to live a truly audacious life? Shannon Hernandez shows how you can in this guest post. You can write a life-changing memoir. Shannon offers her tips in this guest post. Shannon Hernandez describes how her life improved after 15 days of saying "no." Sioux Roslawski shares her review of Breaking the Silence: My Final Forty Days as a Public School Teacher. Shannon Hernandez gives five tips for writing about your passion. Author and teacher Bethany Harar reviews Breaking the Silence. Learn all about what it takes to create a memoir with movement. Get a glimpse of the woman behind the book in this interview with Lisa Haselton. We have a few more dates left in Shannon's tour, so if you'd like to join us contact Renee (renee[at]wow-womenonwriting[dot]com). Enter to win a copy of Breaking the Silence by M. Shannon Hernandez! Just fill out the Rafflecopter form below. We will announce the winner in the Rafflecopter widget THIS Friday, March 13th! Thanks so much for hosting my book. And thanks for listening to the podcast...we have lots of work to do in the world of education, and it don't get done if we aren't actively talking! My daughter is a first year teacher this year. I think this book would be great for her to read. McKim, I hope you enter for the raffle! I am sure she would love this book. My student teachers at Brooklyn College have found so many valuable lessons in it already.